Key FeaturesLearn how to make Android development much faster using a variety of Kotlin features, from basics to advanced, to write better quality code.Build amazing projects to get grips with the Kotlin language for the Android platformAn illustrative guide to write code based on both functional and reactive programming to build robust applicationsBook DescriptionKotlin is a programming language intended to be a better Java, and it's designed to be usable and readable across large teams with different levels of knowledge. Kotlin is a language that helps developers build amazing Android applications in an easy and effective way. 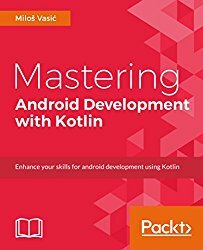 The book will begin by giving you strong grasp of the Kotlin features in context of Android development and it’s APIs to further taking steps towards building stunning applications for Android. It will show you the environment setup and the difficulty level will grow steadily with the coming applications covered in the upcoming chapters. The book will also introduce you to using the Android Studio IDE which plays an integral role in Kotlin Android Development. It will cover Kotlin’s basic programming concepts such as functions, lambdas, properties, object oriented code, safety aspects and type parameterization, testing, concurrency which will guide you to write Kotlin’s code to production. We will also show how we can integrate Kotlin in any existing Android project built using C++ or Java.What you will learnUnderstanding basics of Android development in KotlinKey concepts in Android developmentHow to create modern mobile applications for Android platformHow to adjust your application’s look and feelHow to persist and share application databaseWorking with Services and other concurrency mechanismsWriting effective testsMigration of existing Java based project to KotlinAbout the AuthorMiloš Vasic is a software engineer, author and open source enthusiasts. Miloš holds a Bachelor degree in Programming of computer graphics and Master degree in the field of Android programming, both degrees gained at the Singidunum University. He published his first book Fundamental Kotlin in October 2016 and thus achieved his dream of becoming an author. He's currently employed at the company Robert Bosch where he's working on SDKs for auto industry. When he is not working on a new book Miloš is working on his open source projects. JAVA: The Ultimate Beginner’s Guide!